What is the Royal Mint ? You will probably have a vague idea of the function of the Royal Mint. Or, at least, you are well aware of the fact that it is no relation of the mint imperial that you keep within handy reach while you are out driving. Somewhere at the back of your mind is stored the knowledge that the Royal Mint is the place where all the United Kingdom coins are made. But after that, you are probably somewhat in the dark. Were you aware, for example, that not only does the Royal Mint make coins for the UK it makes coins for an average of 60 countries every year? Thought not. What does the Royal Mint do? Not only that, it also makes coins and medals to celebrate specific occasions. For example, if you want a permanent reminder of the widely-acclaimed London Olympic Games and the Paralympics which followed, you can purchase the official coins, including one which marks the hand-over to Rio de Janeiro in Brazil for the 2016 Games. There was a coin to mark the Royal Wedding of Wills and Kate; one to celebrate the Queen's Diamond Jubilee; a new £5 Gold Sovereign – and so it goes on. With such items you are not merely collecting a beautifully crafted coins, you are also taking into ownership a piece of history. Talking of history, it may surprise you to know that the Royal Mint has been in existence more than 1,100 years, during which time there has, of course, been many technological and scientific advances, so much so that it is now a sophisticated industrial concern. That being so, you may well ask, who is responsible for running it? It is a government owned company which is committed to providing a target-led financial return. Does that worry you? Then relax. The last financial year brought an £8.3 million profit before tax – an increase of £5.2 million over the previous year, and a record for the business. 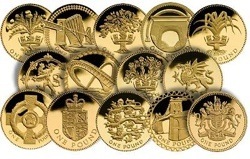 Many people believe that the Royal Mint is based in London. After all, isn't that the financial capital of the world? But no. Its headquarters are in Llantrisant, South Wales, where more than 900 people are employed. The new site was opened by Her Majesty the Queen in 1968 in readiness for the introduction of decimalisation. It is quite remarkable to think that the Royal Mint can produce 90 million coins and blanks – metal discs which are minted into coins - in a single week. That adds up to almost five billion coins a year. No wonder, then, that the Ministry of Defence is responsible for the round-the-clock, 52 weeks a year security of the 35-acre site.